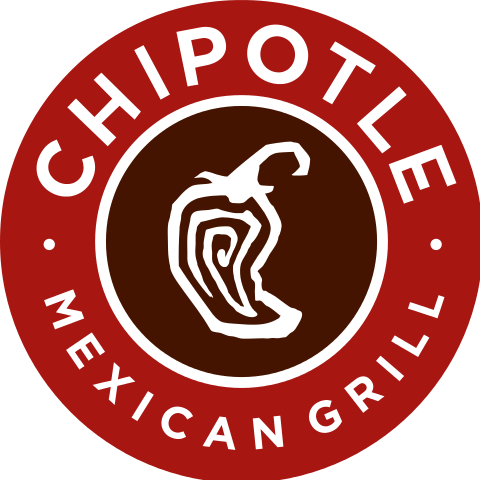 Chipotle Mexican Grill: Is the Brand Intact? There has long been a distinction in the investing community between companies that appear attractive based on “growth” stories versus those that are statistically cheap and supposedly represent “value”. However, as Charlie Munger reminds us, all forms of investing must be centered on identifying value by acquiring assets that have an intrinsic value exceeding the purchase price. Companies that are cheap based on current multiples of earnings or book value could very well represent values — or value traps. At the same time, there are plenty of companies that are extremely expensive based on traditional metrics that could represent good value — assuming continued rapid growth. Despite the flawed distinction between “growth” and “value”, many investors still self-identify as value or growth investors and seek opportunities within a universe of companies perceived to fit within their chosen category. These distinctions, however, often fall away when a “growth” company experiences hard times. Investors focusing on “value” then begin to take a look at these fallen angels and growth oriented investors may turn away given an interruption in their chosen narrative. Chipotle Mexican Grill is an interesting example to look at for a number of reasons. The company had an unblemished growth story for many years and commanded a premium valuation. In late 2015, Chipotle customers became ill due to an E. coli outbreak that affected a number of restaurants. This prompted investigations by the U.S. Food and Drug Administration (FDA) and the Centers for Disease Control (CDC). A total of 55 people from eleven states were affected by the outbreak resulting in the temporary closure of 43 restaurants. Outbreaks of E. coli are not new or uncommon in the United States. Chipotle took steps to address the situation and it appears that the problems have been resolved. The situation at Chipotle received widespread media attention, both through the traditional print and television media and through social media platforms such as Facebook and Twitter. The severity of the outbreak and the fact that the problem did not appear to be isolated to one geographic location gave the impression that Chipotle might have a systemic issue. The company has long been known for fresh ingredients prepared at individual stores. In contrast with fast food operators using frozen foods prepared in centralized facilities, Chipotle appears to have a higher risk business model. Of course, the fresh ingredients sourced from local suppliers and prepared in front of customers has always been a major part of Chipotle’s brand identity. Readers outside the United States are unlikely to be familiar with Chipotle because the company has very few international locations. The company was founded in 1993 by Steve Ells at a single location in Colorado serving a simple menu focusing on Mexican cuisine. Chipotle was one of the pioneers of the “fast casual” concept. Through use of better ingredients and a more attractive restaurant design, Chipotle provided a higher quality experience than large fast food incumbents while still preparing foods to customer specifications in a short period of time. McDonald’s became a major investor in Chipotle in 1998. This investment facilitated an expansion to 573 locations by 2006 when Chipotle went public. The company continued to expand after going public and had 2,124 locations as of June 30, 2016. Chipotle owns and operates its restaurants and has not pursued franchising, in contrast with many fast food competitors. The exhibit below provides an overview of the company’s rapid growth in restaurant count since 2006. Despite news of the E. coli outbreak in the fourth quarter of 2015, we can see that the growth story continued relatively unabated over the ten year period. The restaurant count increased from 573 to 2,010 which represents an annual growth rate of nearly fifteen percent. Effectively, the company doubled the restaurant count and then doubled it again. At the same time, sales per restaurant grew at a healthy pace as well, advancing from $1.6 million in 2006 to $2.4 million in 2016. This represents an annual growth rate of approximately 4.6 percent. The financial crisis and recession of 2008-09 caused restaurant growth and sales to slow but growth picked up in 2010 and continued through 2015. It is notable that restaurant expansion has continued in 2016 at a rate similar to prior years despite the E. coli crisis. Since the company went public, restaurant expansion has been accomplished through reinvestment of free cash flow generated by the company’s established restaurant base. The company has a debt free balance sheet. Since 2006, approximately $1.8 billion has been invested in capital expenditures. According the narrative provided by the company in annual reports, the vast majority of capital expenditures have been related to restaurant expansion rather than maintenance of existing facilities. In 2015, the company had net income of $476 million, cash flow from operations of $683 million, and invested $257 million in capex, of which $180 million was associated with opening new restaurants. Chipotle has very attractive economics when it comes to expansion. In 2015, the company spent an average of $805,000 in development and construction costs per restaurant, net of landlord reimbursements. Based on the company’s experience prior to the E. coli outbreak, each new restaurant could be expected to achieve revenue of approximately $2.5 million per year once established. With an operating margin of 10.6 percent in 2015, each restaurant could be expected to produce operating income of about $265,000 and net income of $164,000. This represents an excellent 20 percent return on incremental investment once a new restaurant is mature, and historically same store sales volume has grown at an attractive rate as well. Despite the attractive economics of adding locations, Chipotle’s free cash flow has regularly exceeded the amount management felt comfortable investing in expansion. The company has returned over $1.9 billion to shareholders via repurchases since 2006. Repurchase activity has accelerated since the E. coli breakout as management chose to repurchase shares as the stock price declined. 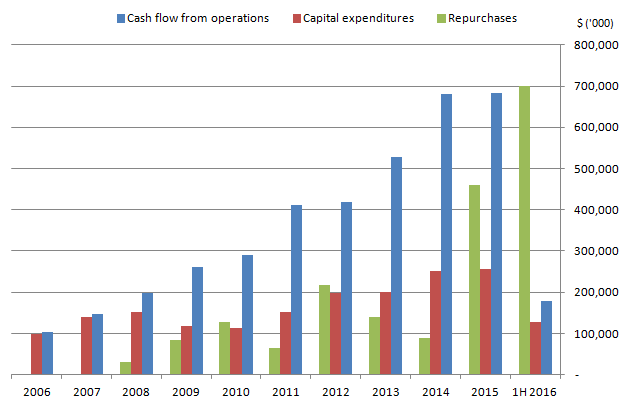 $461 million was spent on repurchases in 2015. The pace accelerated further during the first six months of 2016 as $700 million was spent on buybacks. Deteriorating Fundamentals: Permanent or Temporary? The impact of the E. coli outbreak became apparent during the fourth quarter of 2015 but full year results did not reveal a huge deterioration. However, during the first half of 2016, we can see that the company operated near break-even as margins collapsed. Food costs increased as the company attempted to put in place procedures that reduce the probability of further outbreaks and some waste resulted in the transition to new procedures. Labor costs were not reduced despite the significant drop in sales indicating that the company avoided cutbacks in what should be a variable cost, probably due to a desire to maintain morale. Occupancy costs predictably rose as a percentage of diminished revenue. The decline in comparable restaurant sales for the first half was 26.5 percent. Overall revenue decreased by 19.9 percent, a smaller decline than comparable restaurant sales due to the opening of 114 restaurants during the period. These are clearly staggering declines and have essentially eliminated the favorable economics that Chipotle enjoyed over the past decade. The obvious question we must ask is whether the E. coli scare was a temporary phenomenon or has longer lasting permanent consequences. It is useful to look at this from both a revenue and expense perspective. From a revenue perspective, obviously the question is whether sales will return to levels that prevailed prior to the outbreak and, additionally, whether same restaurant sales can continue to grow at a rate faster than inflation. Chipotle put in place a customer loyalty program called Chiptopia during the summer months and management has indicated that the program was starting to show promising results in July. Chipotle’s CFO stated that “it’s very, very likely that we’ll have something to follow on when Chiptopia ends at the end of September.” However, it did not appear that a new program has been launched as of early October based on a recent restaurant visit. Historically, Chipotle has grown without the need for customer loyalty programs or heavy discounting promotions. This has certainly helped the company achieve the margin expansion discussed above. If a long term extension of Chiptopia is required to continue the sales recovery, this reflects pricing pressure and could impact margins. Expenses are also likely to rise due to enhanced food safety procedures. On a normalized basis, management expects that food safety initiatives will have a 2 percent impact as a percentage of revenues. At this stage, it is very difficult to determine whether the deterioration of the first half of 2016 signals permanent impairment of the company’s fundamentals. It seems fair to assume that operating margins will decrease by 2 percent even if sales recover to 2015 levels due to the higher operating costs identified by management. If sales fail to recover fully, management will probably take steps to reduce variable costs that, thus far, have not been materially reduced (such as labor costs). Operating margins were around 17 percent prior to the E. Coli outbreak and fell to zero during the first half. It is probably safe to view 15 percent as a near term ceiling for operating margins even assuming a full sales recovery. If sales only recover partially, the operating margin could easily settle at 10 percent or lower. Third quarter results will be reported on October 25 and should provide some insight into these questions. Is the stock cheap? Not by traditional (and simplistic) valuation metrics. If earnings recover to 2015 levels next year, the stock is currently trading at nearly 28 times 2017 earnings and is obviously even more expensive if one assumes a more limited recovery. However, if Chipotle’s brand is intact and the growth story resumes in 2017 and beyond, shares could be reasonably valued. Chipotle has not slowed expansion in 2015 which shows a great deal of confidence by management. In addition, $700 million of stock repurchases signals that management views the lower share price to be a bargain. On September 6, Bill Ackman’s Pershing Square Capital Management revealed a 9.9 percent stake in Chipotle and indicated that the stock is “undervalued”. The company appears to have a great deal of room to expand in the United States and has recently signaled that Europe will be a target for additional expansion. Although 15 percent annualized growth in the restaurant base might be too optimistic, if the company can grow locations at a 10 percent rate, the restaurant count could reach 4,000 by 2022. If revenue per restaurant recovers to $2,300 in 2017 (less than 2014-2015 levels) and then grows at 3.5 percent annually, revenue per restaurant could reach $2,700 by 2022. Total revenue under this scenario might be around $11 billion and if we assume an operating margin of 15 percent and a tax rate of 38 percent, net income would be slightly over $1 billion. Expansion opportunities would hardly be exhausted with a 4,000 restaurant count, especially internationally, and opportunities for reinvestment of free cash flow at attractive returns should exist. Market participants might assign a P/E ratio of 25 leading to a valuation of $25 billion in 2022 compared to today’s $12 billion market capitalization. For someone buying shares today, this would result in annualized returns of around 13 percent. Obviously the scenario discussed above is not very rigorous and could be overly optimistic. There are also speculative elements, such as the idea that market participants will value the company at 25 times earnings in 2022. However, the bottom line is really whether one thinks that the Chipotle brand can recover fully. If not, profitable expansion opportunities will be limited and the company’s “growth story” will be broken. In addition to expectations of permanently lower operating results, investors will no longer be willing to pay a premium valuation. Under an adverse scenario involving permanent brand impairment, it is easy to see how today’s valuation is much too high. It is all too easy to come up with fancy models and spreadsheets to bring more “rigor” to a valuation, but doing so might not add much value and could actually create a false sense of overconfidence. In the case of Chipotle, the investment thesis really boils down to whether one regards the brand as resilient or impaired. Investors should start to get a better picture when third quarter results are released later this month but it is likely that a few years will have to pass before definitive conclusions can be drawn. Of course, by then the share price will have already reacted to the developments – whether they are positive or negative.